Yesterday’s Apple keynote was, I think more than ever, a testament to Steve Jobs’s presentation skills. Faced with an audience that had already seen the grand finale, he still had no trouble evoking plenty of gleeful gasps and applause. He even managed to make the now-infamous Wifi glitch amusing and entertaining (if a bit odd), rather than painfully awkward. But despite all of his showmanship and a very impressive new product, the keynote wasn’t quite the game changer that I expected. I don’t mean to say I found the iPhone 4 to be disappointing — it will be incredibly successful, and many of my friends are champing at the bit to get one. But I expected to walk out of San Francisco’s Moscone Center yesterday longing for the next iPhone despite my current allegiance to Android. That didn’t happen. A few weeks ago, an Apple zealot emailed Steve Jobs asking him if Apple had any WWDC announcements that would “blow [Google] out of the water”. Jobs responded, “you won’t be disappointed.” To me, it sounded like Jobs was hinting at something major — a feature or service or device that was simply so much better than Android that it would feel like the G1 vs. iPhone 3G days all over again, when the iPhone was vastly superior. But instead of launching a nuke, Apple’s announcements were a strong but survivable offensive against Android; a retaliation for the recent attacks at Google I/O. Apple has taken the lead once again, but I don’t think Android will be playing catchup for long. Before I go any further, I think I should explain where I’m coming from so as to cast aside (or perhaps, affirm) any suspicion that I’m simply an Android fanboy. I used an iPhone full-time for two years, first with the original iPhone, and then the iPhone 3G. I loved both of them, and for a long time held a rather naive view that Apple couldn’t do much wrong. Then, in mid-2009, Apple started blocking Google’s applications and I began to have serious misgivings about the App Store. A few months later I switched to a Droid, and then to a Nexus One, which I’ve been using for around five months now. Despite my issues with the App Store, I bought an iPad the day it came out and was quoted in the Wall Street Journal saying it was “changing the paradigm of how we will use computers” (a ridiculously clichéd choice of words, but I still agree with them). Of course, my decision to buy an iPad may indicate that I’m a huge hypocrite, but I like to tell myself that I just have a nuanced perspective. All of that said, let’s get down to business. It’s been said many times already, but it’s worth repeating: this thing is gorgeous. It unapologetically abandons the older iPhone’s curves in favor of more defined edges that make the device just look inherently powerful. And, perhaps more important, it feels rock solid. One of the first questions I posed to the Apple sentry stationed next to my demo unit was how resistant the new model was to scratches and falls. His response: “the screen is stronger than sapphire”. A quizzical expression later (I know nothing about gemstones), he explained that this meant it was really strong and would be very difficult to crack. After holding the satisfyingly weighty device for a few minutes, I honestly got the impression that I could throw it against the wall and that it would survive intact (the sentry did not like this idea). I really haven’t seen an Android phone that felt this sturdy or looked this good. 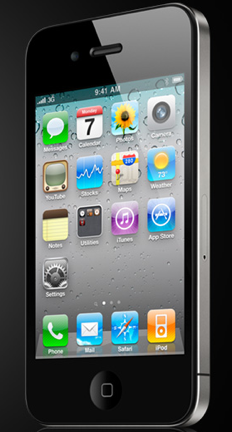 Aside from the build quality, the most striking feature of the iPhone 4 is undoubtedly its screen. It’s sharper than your computer monitor. Reading text on it feels a little surreal, like it is almost too crisp because you’re not used to seeing this kind of display on a phone (a nice problem to have). Again, this blows the screens I’ve seen on Android phones out of the water. If I had to guess, I’d say the Motorola Droid comes closest, but doesn’t match it. One related note on this: switching between the iPhone 4 and original iPhone screen is a little jarring — as Steve Jobs said on stage, once you’ve tried the “Retina Display”, you can’t really go back. Unfortunately, the iPad features a display that is most decidedly not the Retina Display (in fact, it has a lower pixel density than the older iPhone models). In other words, your shiny new iPhone 4 is going to make your 2 month old iPad feel obsolete real fast. Amid all of the announcements yesterday, I think I was most surprised by the lack of news around iOS 4, which made its debut in April and will be released later this month. Granted, this is a huge update, bringing multitasking, threaded conversations in mail, folders, and plenty of other goodies to the iPhone. Thing is, Android already does most of this — I had expected a major feature or two that we hadn’t heard about yet. Multitasking is clearly the big news here, and yes, there is an argument that the iPhone may be able to get better battery life than Android in this regard. But my Nexus One typically makes it all day without having battery issues, and the ‘rogue application’ phenomenon simply hasn’t been a major problem for me (I think it’s affected me twice). And the iPhone still has a a lousy notification system, which I don’t think is as usable as Android’s slide-down tray. In short, this just seems like a matter of preference. This is the wildcard for me. Apple’s execution here is good — you don’t need to deal with user accounts or setup of any kind, which is very nice. But it’s not perfect. The biggest issue here is that it’s Wifi only, which is going to be pretty restrictive. Apple’s marketing videos around this feature are truly touching, but ensuring that those heartwarming moments happen within Wifi range is going to be tough (not to mention that you’ll need to make sure your loved ones are all equipped with the newest iPhone). Of course, this will change in time — carriers will eventually be able to accomodate the increased video traffic, and obviously the market penetration of the iPhone 4 will be increasing quickly. 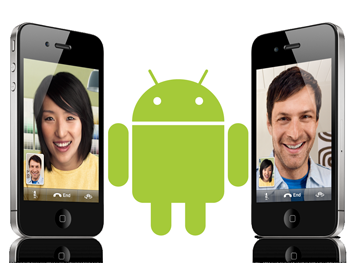 But that will also give Android plenty of time to catch up, especially given that Apple is making FaceTime an open standard (though the logistics of this haven’t been publicized yet). My hunch is that FaceTime will be a major marketing win for Apple and that it will keep going strong with those heartstring-tugging ads. But I’m less sure that people will actually be using the feature regularly in the immediate future. 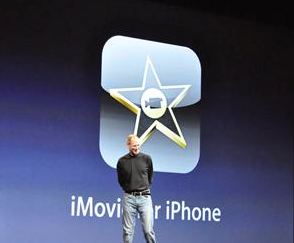 A significant amount of time during yesterday’s keynote was dedicated to showing off iPhone applications. I don’t think any of these will have a major impact on the success of either platform, but they’re worth going over. This is going to be an absolutely huge draw for millions of Farmville addicts. That said, my hunch is that the demographics for Zynga games are more in line with the iPhone than with Android to begin with. If you really wanted to, you can likely get Farmville working using Android’s Flash support. This is the kind of application that Android simply doesn’t have yet (or at least, I can’t find): polished and powerful. Given how terrible the stock Android media player is I don’t have high hopes for this sort of thing coming from Google, so we’ll probably have to wait for third parties to develop something comparable. Jobs spent a lot of time talking about iBooks, namely its ability to now read PDFs and to sync between multiple devices. Note that Amazon’s Kindle app is coming to Android this summer and will feature similar syncing capabilities. This isn’t a new feature for the iOS platform, either — Kindle’s application for the iPhone and iPad already offer the same syncing (and work with Kindle devices as well). After handling the new iPhone, there’s little doubt in my mind that my Nexus One is no longer the state of the art. The screen isn’t nearly as sharp as the iPhone 4, the build quality isn’t as good, and I don’t have a front facing camera for video chat. Most of these shortcomings hold true for other popular Android devices like the Incredible and Evo 4G (though the latter does have the front camera). But despite the fact that my phone doesn’t quite match up to the iPhone 4, at no point yesterday did I consider jumping back onto the iPhone bandwagon. My Nexus One doesn’t feel much slower than the iPhone (especially since upgrading to Froyo). I can’t see myself using the phone video chat in the immediate future, especially given the Wifi limitation and the fact that I’d only be able to use it with other technophiles initially. And while the iPhone 4’s screen is pretty damn amazing, it isn’t nearly sharp enough to overcome my disdain for AT&T. What’s more, I’ll be surprised if Android devices don’t surpass the iPhone’s hardware capabilities within the next four months or so. We’ll probably be seeing sharper screens, faster processors, and even integrated gyroscopes (another feature launching with the iPhone 4) on the next wave of devices. And from a software perspective, Android actually seems poised to start beating Apple on some fronts, namely its connection with cloud services. Despite rumors leading up to WWDC, Steve Jobs didn’t once bring up Apple’s MobileMe cloud service during his keynote. During his interview at the D8 conference he said that Apple was working on wireless tethering/sync features, but it seems like Google has a head start. In short, more than ever it looks like Android and Apple are in a dead heat. And that’s a great thing for all of us. Even you fanboys who didn’t read this far.